Dr. Schultz with Olympic Gold Medalist, Jen Suhr at the 2013 Drake Relays. Jen has been ranked #1 in the World for the last 2 years, has been the #1 American pole vaulter since 2006, and has won a total of 15 US National Championships. Dr. Alan Schultz has been working with sports injuries for over two and a half decades. Dr. Schultz worked with two Olympic medal winners during the Drake Relays. Dr. Schultz adjusted 50 college track and field athletes during the Drake Relays, as well as performing acupuncture for some of the runners. Many college coaches also received chiropractic care during the relays. Chiropractic care keeps marathon runners in peak condition. Dr. Alan Schultz has been working with marathon runners for nearly 30 years. 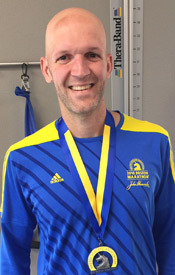 Cade (pictured left with a medal) runs 30-33 marathons per year, including Boston! Wow!! Cade has run a marathon in every state and all in a time of under 3:30. Other marathons for him are in the 3:06 range. For such physical and demanding a marathon performances, chiropractic has a proven track record for sports injury and pain treatment. Basketball injuries can be devastating to a player’s performance. Dr. Schultz has been the chiropractor for the Drake Men’s Basketball Team, in this capacity adjusted the team on a weekly basis. Kareem Richardson coached at Drake. He then went on to coach at Xavier and Louisville. He is currently the head coach at the University of Missouri-Kansas City. Dr. Schultz treats tennis related injuries including: Tennis elbow, knee pain, foot pain, shoulder and neck pain, back pain and hip pain. Dr. Schultz works with military personal stationed at Camp Dodge. Dr. Schultz works with soldiers that are returning from the battlefield. He also works with soldiers before and after their PT testing each year. FMS is a 7-point movement screen designed to identify dysfunctional movement patterns and asymmetries within the body. It is mainly designed for the physically active individual. However, FMS is used at Schultz Chiropractic Wellness Zone as a starting tool for anyone that walks in the door. From professional athlete to high school athlete, FMS finds hidden problems for athletes. With detection, injuries will be prevented, keeping the athlete in his/her sport and at peak performance. After discovery of asymmetries in the athlete, patients/athletes are given specific exercises (see Schultz Rehab). The key to reducing the risk of serious sports injuries is conducting a FMS. Injuries that were once seen mostly in active adults are now occurring more frequently with children. In a time when young athletes are more likely to specialize in one sport and participate year-round, youth sport participants are more prone to injury than ever. Protect your child with regular adjustments at Schultz Chiropractic, where experience matters. For example, as many as 28% of football players in organized sports will sustain an injury between the ages of 5 and 14. Thank you for visiting our site. I look forward to meeting you in person and hope to help you become an even better you! Call our Johnston office and schedule an appointment today!